There was a lot of activity at Old Kingsbury Aerodrome on Friday, May 6th in preparation for the annual Spring Air Fair event scheduled for Saturday, May 7th. Curtiss Canuck - Steve Freeman, Art Caballero, Dave Edgerly and Dave Orloff worked on getting the Canuck ready to fly at the event. An OX-5 expert from Kerrville, Texas - Phil - had supplied a rebuilt water pump with modern upgrades (modern seals and stainless steel shaft) and had rebuilt the carbs – the reason the Canuck ran so poorly last outing was because the carb was full of slime from constantly being dripped on by the water pump leaks. Phil also fashioned a water deflector shield so that nay drips from the water pump wouldn't land on the carbs! 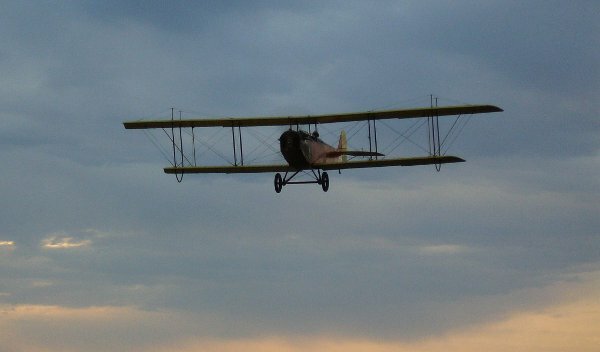 A Curtiss prop had been located in the collection, and while slightly dinged, didn't have any delaminations. Art caballero stripped the prop earlier in the week, and Kurt Maurer refinished it so it was ready for install on Friday! So the Canuck gang of four pulled the old prop and installed the newly rebuilt prop. It didn't go well at first - the proper tools couldn't be located, but Kevin Monahan and Art put their heads together and created a tool that worked. After lunch Steve flew the Canuck twice. On the first flight the engine started on the 2nd throw of the prop!! Steve likes the airplane's performance with the clean running motor and the refinished prop on it. Airplane Washing - apparently didn't receive a lot of attention early in the day, but planes were washed starting mid-afternoon on. A few didn't get washed at all, but most received some attention! Meyers OTW - the decision has been made to go back to heavier aviation oil for the Meyers, as well as run av-gas in it. Billy Cheshire flushed out the oil tank on the Meyers, and he, Dave Orloff and Bob Gardner helped refill the Meyers with the replacement oil. Steve also flew the Meyers - took Billy along for the ride, and to ensure the oil tank was well sloshed with the new lube dthey did some aerobatics. It is hoped the new heavier aviation oil will help prevent the engine from drooling so much oil out the exhaust stacks as well as do a better job of lubricating the internals! The field “restroom” and pavilion got power washed for the event, and apparently the restroom pad has proven to be something of a pigeon roost. Reports are that task was messy and awful! Everything was moved off the shop apron so it could be cleaned thoroughly. Everything was so dry and dusty that volunteers were sweeping the shop apron Saturday morning as well! The Millers spent a fair amount of time and energy on Friday preparing the concessions area for business the next day. Steve Freeman's award-winning PT-22 was washed by Steve and Al. Kurt and Al pulled out the nicest of the Model T Touring cars and washed it for display alongside the re-enactor's campsite. Kevin Monahan and Kurt Maurer set up a battery charging station for the various Model T batteries. Al Sumrall donated two new batteries to the cause. Air Fair started with all Model Ts having fully charged batteries for the day! There was a lot of effort expended by various people on the Fokker Dr.I's rotary engine. It seems like the ignition timing is off, so Steve Freeman, John Goble, with an assist from Kurt tried to get to the bottom of the engine's issues. Attempts were made to start it when they thought they had it whipped, but observers noted flames shooting from the exhausts in all the wrong places. That issue remained unresolved by the time the event rolled around. 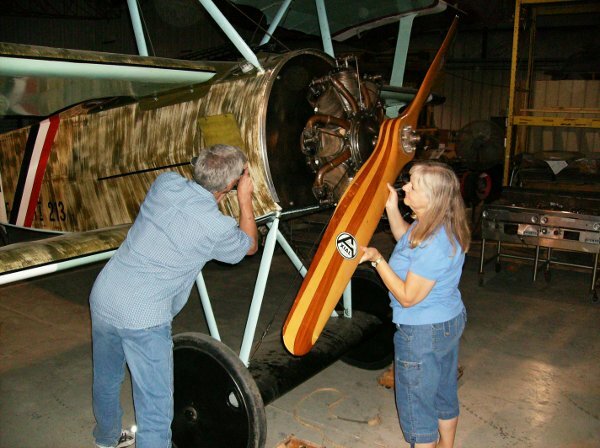 Kurt and Al installed Kurt's Spandau replica guns on the Fokker D.VII so it was ready for the event. Kurt is starting to believe the D.VII is his - it currently sports the prop he built last year plus this new set of dummy guns. Additional work was done on the vehicles by Cameron, Ian and David Whitaker. Cameron rebuilt the Indian's carb during final exam week at college - it was reinstalled Friday and the bike ran very, very well! Kurt installed an “ooogah” horn on the US Ambulance, and fashioned leather straps to hold the water can on the French Ambulance's floorboards. Cameron also worked the French Ambulance's electrical systems. David Whitaker got the Nash Quad running. Brent Alexander donated a fuel filter which made the Quad prance with joy, to hear Al tell it! Duncan Charlton dropped by to tweak the Triumph motorcycle - tuning it up and tending to minor issues so it would be ready for Air Fair. Brent removed the fan assembly from the Model T wrecker because of a broken pulley. The vehicle will run fine as long as you don't go too slow for too long! Brent and Al donated 15 gallons of fuel for the vehicles, and Dave Whitaker donated five gallons of gas. Terry Bledsoe spent his entire day working on the grounds - which included mowing the runway areas. Bob Gardner and another volunteer walked the runway looking for foreign objects. Terry has the grounds very much cleaned up, roads repaired, everything mowed and trimmed. Looked excellent!! Apparently the best part of Friday came after the workday was done. Tammy Orloff, Diane Edgerly, Linda Goble, and Jerrie Bledsoe helped coordinate a wonderful BBQ dinner to accompany the usual beers and cigars! !